The opening of Pizza House in the mid-1980s gave Ann Arbor locals a second location to get their Chipati fix (the stuffed salad was first introduced in the 1970s at Pizza Bob’s). 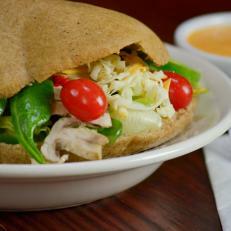 The simple medley of lettuce, mushrooms, cheese and peppers stuffed in a thick, freshly baked pita has a cult following. The secret is in the sauce – a bright orange, zingy, creamy concoction – which is served both as a dressing and as a dip for the bread.